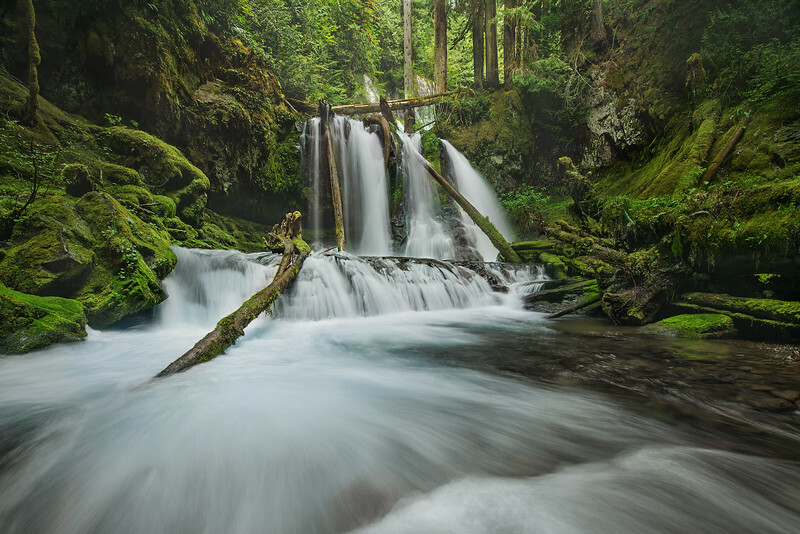 I’ve visited Panther Creek Falls before and it’s a little bit of a tricky waterfall to find. There’s a marked trail that takes you to a viewing platform at the top of the upper falls (which you can see peaking out at the top of the waterfall here) but that’s not the best place to actually *see* the waterfalls here. Instead, you have to backtrack a little and find the unmarked “trail” that takes you down the steep cliffside to the base of the falls. The first time I had visited Panther Creek I only photographed the Upper falls, afraid that getting down to the lower falls was a little bit sketchy. This time, though, Zack, Willie, and I found a safe route down to the Lower falls, put on our frog suits, and crawled out into the river with our cameras. The trees that lodged themselves inside Lower Panther Creek Falls have been here for years. They’re part of what makes this scene so photogenic. The waterfall is best viewed from in the river but we had to make sure to be verrrrrrry careful when walking in the river: the current was fairly strong and the rocks below it extremely slick. We basically plopped the tripod down for support, then shuffled our feet a bit, and repeated until we got in the right spot.